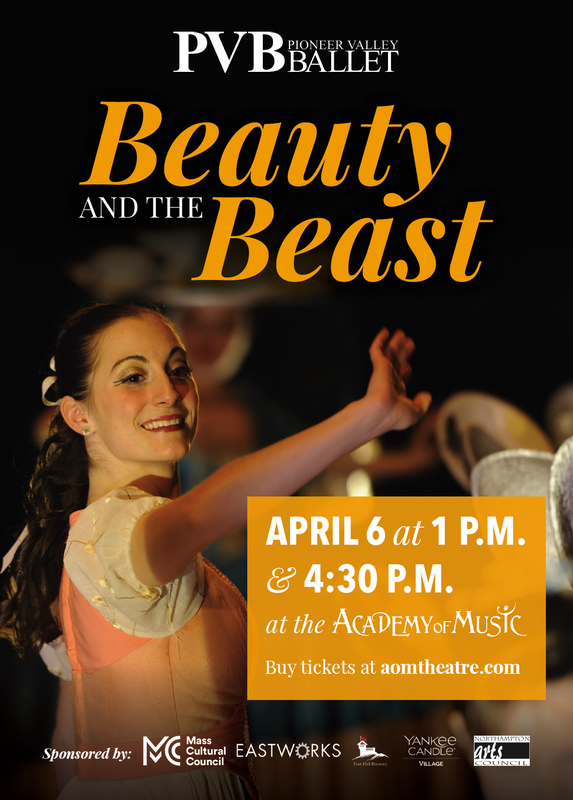 Pioneer Valley Ballet (PVB) brings its original production of the classic fairytale Beauty and the Beast to Northampton’s historic Academy of Music Theatre for two full-length performances on Saturday, April 6. In addition, a 45-minute Mini Beauty and the Beast sensory-safe performance will be presented the next day at Yankee Candle Village. Under the direction of Co-Artistic Directors Maryanne Kodzis and Thomas Vacanti, Beauty and the Beast showcases dozens of PVB dancers, hailing from towns throughout Western Massachusetts, alongside guest artists. A moving ballet based on the French tale made famous by Jeanne-Marie Le Prince de Beaumont, Beauty and the Beast is full of whimsy and magic, weaving the powerful story of a young woman who discovers the true meaning of love in an unexpected place. PVB’s ballet features choreography by Vacanti and Kodzis, set to the music of Czech composer Antonín Dvořák. Beauty and the Beast performances will be held at the Academy of Music Theatre on Saturday, April 6 at 1:00 p.m and 4:30 p.m. Tickets, including children’s and senior rates, range from $22.50 to $43 plus service fees. Group rates are also available. The following day, on Sunday, April 7 at 3:00 p.m., PVB will present an abridged, 45-minute version of the performance – its Mini Beauty and the Beast – at Yankee Candle Village in South Deerfield. This performance is for families with children of all ages and is designed to be sensory safe, with reduced sound and lighting to accommodate sensory sensitivities. Tickets are $13, with an $11 rate for children and seniors. PVB is a non-profit, mission-based organization with studios at the Eastworks building in Easthampton. Its programming includes year-round training opportunities for dancers of all ages; two annual productions (including The Nutcracker) with student, community, and professional dancers; and extensive dance outreach to the community. This year’s production of Beauty and the Beast at the Academy of Music is supported by a grant from the Northampton Arts Council. Tickets to those performances can be purchased directly from the Academy of Music Theatre Box Office, online at www.aomtheatre.com, in person at 274 Main Street in downtown Northampton, or by phone at 413-584-9032 ext. 105. The box office is open Tuesdays-Fridays from 3:00-6:00 p.m., and also opens one hour before each performance. Tickets to Mini Beauty and the Beast at Yankee Candle Village are available at https://dancestudio-pro.com/tickets/pioneervalleyballet. For further information about the Pioneer Valley Ballet, please visit www.pioneervalleyballet.org.